First I must say that it has been a VERY long time since I have posted a blog. I think I was honestly waiting to put this up as my next so here I am now. I am finally ready to present my latest short film, Triangle. Triangle follows the character Paige, a victim of domestic violence. One day while running errands, she bumps into Kyle (literally) and this begins a romantic affair. Confused in the mess of her pain and new love interest, she makes an irrational decision to follow Kyle's plan to kill her boyfriend, Mark. Paige sees it as an escape to finally end the pain Mark is causing her. Is she really doing the right thing, or is she just seeing her violent lifestyle from a different perspective? When I set out to do this film, I had the intent of covering a lot of ground. I have met people who have been in abusive relationships, had love affairs, and going to extremes with the best intentions. It occured to me that combining these elements could ultimately provide a life for a damaged character where they may do anything to save themselves. No one truly knows how to handle pain when it is thrown at them for no reason. I wanted to show a relationship between people that would not only make the audience sympathetic, but understand this happens everywhere in the world (maybe not to this film's extent, but in some sort of way). 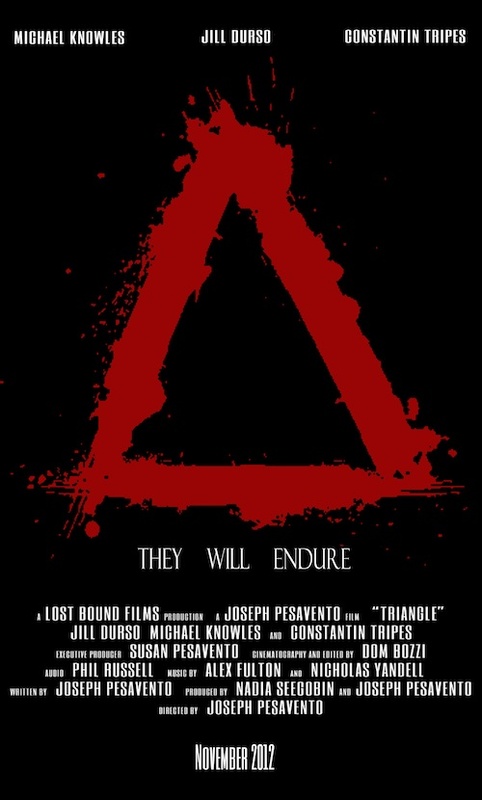 Triangle touches me in a way that most people may not understand, but it is important that a film like this is made in the way those horrible situations take place... uncensored, unaltered, violent, and disturbing. It is a very touchy subject for not only humanity, but for people I love and who are close to me. By no means did or do intend to mock, ridicule, provoke, or make parodies of these horrible acts. However, it is a powerful subject, so the imagery of such should be just as powerful. Whether you like it, love it, are disturbed, or think it's one of the worst films you have ever seen, I encourage you to watch this. Your feedback, positive or negative, mean the world to me. This film was made for everyone who has supported me. Now... support the journey of Paige, Kyle, and Mark. They will endure.